At the beginning of this year I made the decision to establish a morning routine so that I could live purposefully. I didn’t want another year being stuck; feeling like I missed my “breakthrough” or opportunities – again, and by a longshot. As much as I’ve tried to work harder to be more successful, it has resulted in only working more for the same money and being frustrated. Time to find a new game plan. That when I set out to establish a morning routine. It seemed to help others with the mindset they needed for the rest of the day. Nearly all the other successful entrepreneurs and speakers I listen to have morning routines and get up at 0-dark-30 to do them. But the thought of getting up earlier didn’t make me want to throw a party. The evening is when I get most of my work done. At the same time, I’m one of those people who feels guilty for sleeping past 7 am – even on the weekends, but a 6 am wake-up call feels like torture. No matter how late or early I go to bed, my sweet spot for waking up is around 6:30 – 7ish. Don’t get me wrong. I love the idea of getting up early and checking off my entire morning routine list before 8 am. Of the few times that I have actually had to get up early for something, I found I had a productive day – and it never felt rushed. I even started setting my alarm for 6 am, but by golly – when it goes off, I seriously feel like I want to punch someone. Even though I struggle to get up before 6:30 am, I found that having a morning routine, no matter what time I get up, was making a big difference. I was more focused, organized, consistent…but there was one problem. I kept running out of time to complete everything I wanted to. It WAS a pretty big mistake for which there are NO EXCUSES. I had to eat some humble pie and then set out to fix it. I also asked myself why did this happen? Obviously, I allowed myself to take my focus off of what was necessary for the week. Maybe it was Summer Fever and I drifted off into La-La land, but I learned a long time ago to keep asking WHY until I reach an AHA! moment. It didn’t take me long to get to my AHA! moment. I knew instantly what happened. My office was a wreck, my income was sliding the wrong way, emotionally I was in a “funk”. It wasn’t about one client. It came down to this: whenever I struggle (spiritually, emotionally, mentally…) it’s because I get lazy and skip my morning routine. Obviously, I have not been serious about my morning routine. Even though I wasn’t getting up early, I would do my best to check off everything on my morning routine list. The problem was, the later I woke up, the more distractions I had. Then I’d get only part of my morning routine accomplished. Eventually, about two months ago, I forgot about my morning routine altogether. During those couple of months, my business started to drop off and I found myself getting into a bit of a “funk”. After making such a big mistake with a client the other week, I knew right away that the reason I had made the mistake was that of my morning routine. *I PUT THE KINGDOM (of God) FIRST. MY MORNING ROUTINE MAKES ME LIVE PURPOSEFULLY. I purposely do SIX THINGS in the morning to set a productive and powerful tone for the day. And when I don’t do it….well, that’s when I drop the ball and make a mess. I guess you could say that a morning routine repels stupidity and accelerates breakthrough! All I know is, my recent mistake with a client that I value very much, was a wake-up call to be determined to get my tush out of bed and live purposely! Write 20 minutes minimum (anything on my mind). Declare Ephesians 1 out loud and in the first person. Re-write out my goals AND speak them out loud (this keeps them always in front of my eyes and mind). This prepares my mind, soul, spirit, and body for the day. I think of these steps not as obligations, but like the north star. 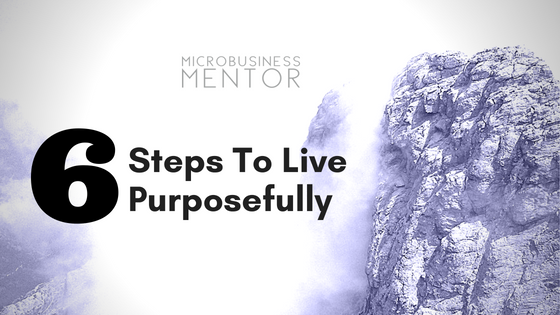 These steps force me to live purposefully and provide a fixed point and direction in my life. When I get lost or veer off course, I can easily make a course correction and get back on track! Also, in order to do all six of these items, I have to get up early. I find that makes ALL the difference. Otherwise, I feel rushed or I skip some of them, or my mind isn’t engaged but rather, I’m simply “going through the motions” and thinking about how quickly I can get through my checklist. I’d love to hear what you do to live purposely. This is something that I’m learning but yet to master!